2.14.09 A warm stretch melted most of our snow, but winter still looms for weeks ahead. I battled with my database software and played "find the object" till I completed our catalog of African artifacts. I learned a lot, but it feels anticlimactic because still I don't have a way to match up the photos with the listings. But that refinement can wait for another day. Scanned a lot more Hollywood photos for listing in my Ebay store. Still have to actually do the listings. I'm impatient with slow work (unless it involves colored markers or video). Pushing ahead with "Zuzu and Zim" material. Not sure what will emerge, but it's pulling together drawing, philosophy and other interesting threads. I get good feedback on intense color. To the right is a motto that I think is the ultimate magic charm. I have a French poster in my bathroom (an ad for bicycle tires). 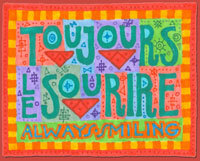 "Toujours le sourire," it says, which I think translates to Always Smiling. Jim and I took the afternoon yesterday to have lunch out (Indian buffet) and go to a photography show at the George Eastman House.